The system includes one draw call Volume Clouds, an Ocean system, GI Proxy for Global Illumination & a physically based Sky Rendering system with atmospheric scattering. The Sky Manager provides automatic or on demand day/night cycle & smooth weather transitions. 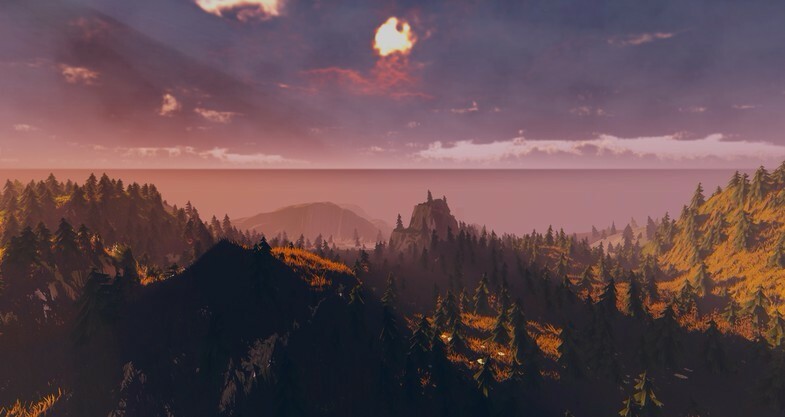 The skybox mode offers complete integration with Unity 5 and all its features (IBL, GI, Skybox). Advanced particle effects like global/local Turbulence & Attractors, Particle sticking- propagation-spreading & particle to particle collisions (ideal for ice/fire simulation), Tornadoes, Volumetric Fog/Smoke, volcanic eruption & lava flow, rain, chain lightning & more are also included. Create spectacular skies, dynamic clouds and weather systems, with time of day and seasonal changes. Use indirect lighting with Global Illumination Proxy system. 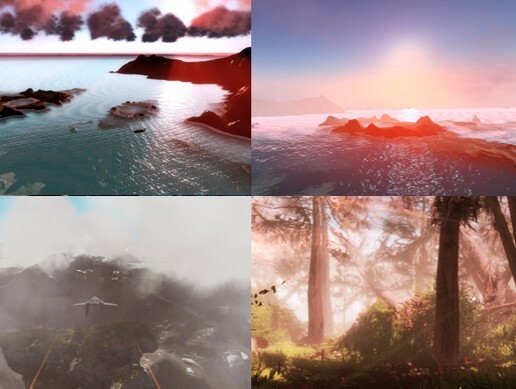 The system has been created to deliver realistic Skies & Weather effects, with seasons and dynamic clouds, scalable depending on the hardware target. Sky Master works on all platforms (most modules of v3.2 are mobile ready*, some modules like the volumetric fog are Desktop only. The mobile version of all features will be integrated in the configurator in v3.3 of the asset). The new in v3.0 Ocean system provides a complete water solution, with shore lines, underwater, multiple wave options and fast speeds. *For details on mobile platform support for the various Sky Master v3.0 modules and demos for testing on Android, please contact me in the support email or the forum thread. Extreme optimization, all systems working together (sky-ocean-volume clouds-shader clouds) may take as little as 4ms CPU usage or less. - Integration with InfiniGRASS asset, Unity & SpeedTree trees-billboards, meshes. - New Volume Weather module that uses the volumetric clouds & fog for realistic weather effects. -Centralized Volumetric fog and sun beams control with preset system, for easy access to various settings. -Volumetric cloud enchancements including TOD control & sprite sheet use for texture variety. - NEW(v1.5)-Complete integration with Unity 5 & all its features (IBL, GI, Skybox) with the new skybox mode. - NEW(v1.5)-New performance oriented shader & asset bundle & more ready to use prefabs. - REAL SKY - Physically based atmospheric scattering, for realistic sky rendering & Artistic special effects. - REAL CLOUDS - Dynamic cloud formations, affected by season and wind. Volumetric particle clouds & fog. - REAL SUN RAYS - Dynamic sun beams, with smooth transitions & occlusion system. - REAL FREEZE - with Ice system, for ice spreading, propagation and stick to objects. - REAL VOLCANO -realistic volcanic eruption, smoke & lava flow. - REAL LIGHTING - Global Illumination Proxy for indirect lighting. - IBL Proxy for Sky color based lighting. - Area lights Proxy (with point lights), GI enabled. - Support for Jove point lights for GI. The framework is written in C# code and the source code is provided. The GI Proxy asset is bundled in the pack. Important: From the next major version of Sky Master ULTIMATE the Legacy particles for Volume Particle Cloud System will be removed and the new Shuriken particle based system will be the default, so it is advised to use the Legacy to Shuriken converter to convert any custom volume particle cloud prefab that uses Legacy to Shuriken and use the new Shuriken system to create new custom volume particle cloud prefabs. The converter will remain until Unity removes Legacy particles from the platform. The default prefabs need no conversion, as will be already converted for the new Shuriken system.